When there are warm temperatures outside it's time to bring out the all white. While, in Santa Cruz, hubby and I went over to a vegan spot nearby called the Saturn Cafe recommended to us by Nicolette Mason. I love when I post pictures on Instagram while traveling and people give me advice on places to go. I decided to wear this all white look. This fun top is from Charlotte Russe and the new plus size clothing that they are launching. I know you may say I don't know if wearing all white and going to dinner should happen simultaneously. HA! I'm not the most careful eater, but when I am wearing something I love I take extra care not to mess myself up. It's a multitasking adventure during the entire meal time, but I like and challenge, and I succeeded in not spilling. 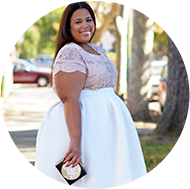 Charlotte Russe is launching a plus size, and I got the details and insight on the clothing. Let's just give a cheer for more options. Whoop Whoop! Charlotte Russe will now be offering sizes 0 to 24 online and in select stores. This fun little top is a part of the launch. The line will be offering tops, bottoms, dresses, jumpsuits, and denim. I had a chance to try a variety of items, and this line will be in junior plus sizes. I would advise sizes up 1 to 2 sizes per garments. All items I tried were in a 3X. This top is in a 3x as well. I included some of my favorite pictures of the line below. This post is sponsored by Charlotte Russe, all opinions and style are my own.